In a medium bowl, stir together Bisquick™, milk, cream, egg and melted (cooled) butter. Add chopped Oreo™ cookies and stir to combine. Preheat your waffle iron and spray it with non-stick spray (optional depending on waffle iron). Stir waffle batter to make sure it’s an even consistency and the cookie pieces are distributed throughout. Ladle 1/3-1/2 cup of waffle batter into the waffle iron and close it. Cook until waffle is golden brown. 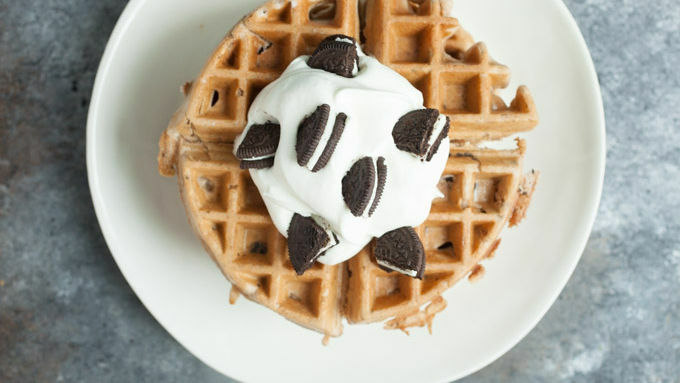 Serve waffles topped with whipped cream and more Oreo™ pieces. Yields 4 waffles. Attention cookie lovers! I’m about to rock your breakfast world with these cookies and cream waffles. They are easy to make, and at the same time decadently rich and light and fluffy. I love Oreo™ cookies as much as the next red-blooded American, but I have a bit of an impulse control problem when it comes to them. I’ve found if I use them in a recipe, though, I can get the same flavor without eating the entire package. That’s where these waffles come in. The easy part of these waffles comes from using Original Bisquick® mix for the base recipe. I made some tiny adjustments to the recipe on the box, like using butter instead of oil, and substituting some of the milk for cream for extra richness, but you could use the original amounts if you wanted. Of course, the real key is to add the Oreo™ pieces into the batter! Dice up most of them pretty finely so they fold in easily, but leave some chunky pieces as well. Just be sure to stir the batter before adding it to your waffle iron so everything is mixed well. You could serve these beauties with maple syrup, but personally I like to top them with some homemade whipped cream and even more crushed cookies. After all, these are all about the cookies and cream combo! You can sub in other favorite cookies for the Oreo™ cookies in this recipe. Just stay away from anything that has a lot of melt-able chocolate or caramel that could mess up your waffle iron. Attention cookie lovers! 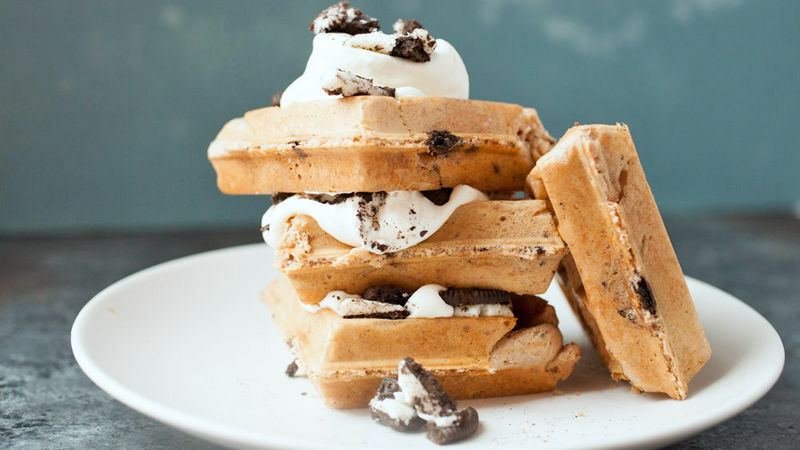 I’m about to rock your breakfast world with these cookies and cream waffles. They are easy to make, and at the same time decadently rich and light and fluffy. I love Oreo™ cookies as much as the next red-blooded American, but I have a bit of an impulse control problem when it comes to them. I’ve found if I use them in a recipe, though, I can get the same flavor without eating the entire package. That’s where these waffles come in. 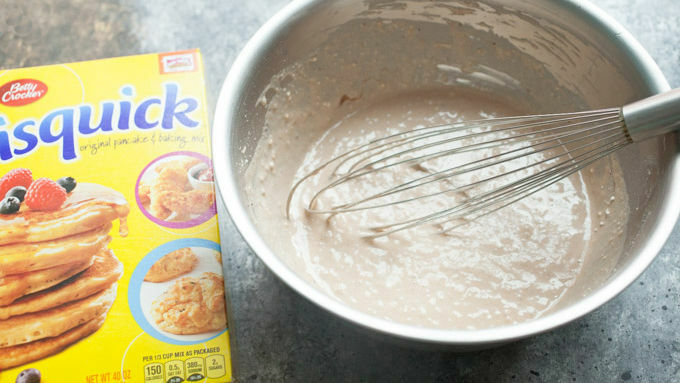 The easy part of these waffles comes from using Original Bisquick® mix for the base recipe. I made some tiny adjustments to the recipe on the box, like using butter instead of oil, and substituting some of the milk for cream for extra richness, but you could use the original amounts if you wanted. 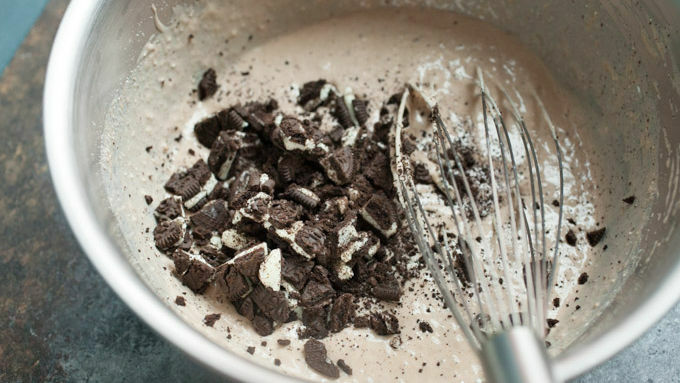 Of course, the real key is to add the Oreo™ pieces into the batter! Dice up most of them pretty finely so they fold in easily, but leave some chunky pieces as well. Just be sure to stir the batter before adding it to your waffle iron so everything is mixed well. You could serve these beauties with maple syrup, but personally I like to top them with some homemade whipped cream and even more crushed cookies. After all, these are all about the cookies and cream combo!